I was not quite as aware as perhaps I should have been about how passionate some Scots are on national income accounting, whether for their national GDP or government, when writing about the issue yesterday. I made what I thought a glaringly obvious observation that Scottish GDP is not determinable with any accuracy because much of the data required to calculate it, such as taxes, imports, exports, investment, savings and more besides, is simply not reliably available for Scotland and is instead based on estimates provided from what I called London, which was a euphemism for the whole Westminster controlled machinery of government. Then I was subject to a quite extraordinary day on Twitter, where I simply had no chance to follow all that was being said, as well as more than double normal traffic here. Let’s be clear; some thought what I said made complete sense. Most appear to be on the Yes side of the debate. The aim of GERS is to enhance public understanding of fiscal issues in Scotland. The primary objective is to estimate a set of public sector accounts for Scotland through detailed analysis of official UK and Scottish Government finance statistics. GERS estimates the contribution of revenue raised in Scotland toward the goods and services provided for the benefit of the people of Scotland. Despite the emphasis on the word estimate I was assured that this document is a) reliable and b) quite emphatically based on the work of Scottish civil servants whose good work I was insulting. I was frequently asked if I had read the methodology for its production before writing (to which the answer was yes, because this is an issue I ha visited before in discussion on the Scottish economy). Note the emphasis on the word 'estimate': that is key. Note that there are 26 variables. As far as I can tell two (local authority income and, maybe, the estimate of Scottish oil revenues) are definitely calculated in Scotland, and the latter is an estimate, not a fact, which is pretty significant in this case. Another three or fur minor ones (car tax, aggregates levy, airport taxes) are likely to be locally accurate. The remainder which is the vast majority) are figures supplied, as I suggested, by Westminster linked organisations, or ‘London’ as I called it. I think I can happily rest my case with regard to that claim. If anyone suggests this data was made in Scotland they are deluding themselves. Whatever else might appropriately be described as such, this data is not. Second, is it reliable? Let’s just think the big taxes such as income tax, NIC, VAT and corporation tax. As yet Revenue Scotland are not sure who is tax resident in the country, although they are working on it. This data is not based on any such split. It could be wildly inaccurate, just as Revenue Scotland’s attempts at working out who is tax resident were. As to NIC, nothing requires an employer in Scotland or England to say where their employees are located. The fact the NIC is paid from a particular address is neither here nor there: it may give a hint. It is just as likely not to do so. The same is true for VAT. Scottish VAT is declared on whole of UK VAT returns: no one knows how much is due for Scotland. It’s guesswork based in a consumer survey. Now just imagine for a moment that company accounts were based on extrapolated consumer surveys to work out how much people might have spent with the company instead of using the accounting records and consider which is better, and you get my point. A distinctly poor option is being used. Last, there isn’t a person on wealth who knows how much profit is declared in Scotland. I suspect that not a single company that straddles the border knows. And why should they? Right now the data is meaningless. In that case no one has a clue what Scottish corporation tax owing should be. So the resulting figures are estimates that I would suggest are subject to an enormous degree of uncertainty. As I tell my students when I teach them about data quality (and I do on my course at City, University of London) some data is crap. That is a technical term. It stands for Completely Rubbish AProximations. This data meets that criteria. And it could be manipulated. Heaven forbid that such a thing has ever happened. That’s what I claimed. And I think I was right to say so. This is some very approximate data that Scotland does not control being used for a purpose for which it is not fit, which is to say whether or not Scotland would run a surplus or deficit post independence when just about everything, including the data, would be different. I have to say those protesting do so without justification. This information cannot sustain the claims they make if it whilst mine are wholly justified. Either GERS is a reliable basis for calculating economic factors as they relate to Scotland in the UK, and therefore as basis for estimating the starting position of the Scottish economy if the UK was broken up, in which case we should continue to use them while improving where necessary. Or it is not a reasonable basis for the reasons you say, i.e. it is impossible to extricate distinctly Scottish economic data from the over all UK data. In which case it is evidence that Scotland and its economy are even more intimately linked with rUK than we thought. In which case “independence” is an even more stupid option than if GERS was actually reliable. OR: if we don’t know the numbers how can the SNP say we would be better off? …but the point still stands: if the figures are as unreliable as Richard says, how can they know? I gave you a link to the Record. No doubt Andrew Wilson and Derek McKay will publish the details in due course. 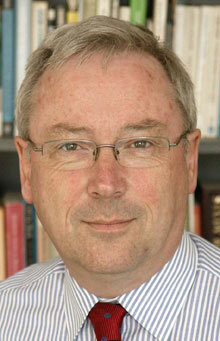 Wilson say 5-10 years austerity. And nobody is challenging the story. It’s in all the papers and no refutation from the SNP. But we’re going to have that anyway…. We’re going to have 5-10 years Tory austerity. That’s bad enough but Wilson is admitting EXTRA austerity. Andrew Wilson already said the story was innacurately reported. The Daily Record ? Apart from the fact that the story is already being rubbished as untrue as to its content I “vowed” never to read it again after its front page lies in 2014. Do you honestly believe that the GERS numbers are accurate Mr Gallagher ? Is that an endorsement of carefully selected spending cuts? – e.g duplicated or wasteful or unproductive government functions. Even I know that raising taxes or selling assets raises revenues and cutting spending cuts costs – but that’s not much use to me without details. If we are told we will be independent on a certain date we need to know the basics…. what is the value of our GDP, tax base, borrowing capacity and current expenditure. And how are these elements spread and shared throughout the economy, geography and population. That’s why GERS is important. And why if it’s right we should use and improve and if its wrong then we can have no confidence in any prediction based on GERS numbers and therefore no basis for judging whether “independence” would improve or damage our economy. And therefore no economic justification for supporting “independence”. You mention Policy, but that can only make a difference in the medium to long term (and success is not guaranteed even then BTW). In fact the SNP is now admitting there would be a period of increased austerity. They say 5-10 years but that’s just a guess. Ireland was mired for decades. Let’s be practical here: my grandson is 8 years old and my granddaughter is 5. A period of ten year increased austerity could ruin their education and their health care. That’s an entire (real) generation sacrificed. For what? According to you, we don’t know. According to GERS a £15bn annual deficit. I’m not buying that and neither should anyone else with children or grandchildren or elderly relatives or anyone who depends on current levels of public services. And I haven’t even considered what currency all of this is transacted in. As for Trident. I would abolish it as well. But’s peanuts in relation to the scale of the problem. UK Trident bill = £100bn/30yrs which = £3.3bn/yr. Scotland’s share 8%-10% = £300m/yr from a £30bn revenue budget. How many countries based their independent economy on replicating the policies and fiscal regimes that were applied by the dominant authority within their previous relationship? If this were the case there would be no Slovakia, no Latvia, no New Zealand, Norway and on and on. The economic argument would have relevance perhaps if the land was a desert, the seas polluted and the population illiterate, otherwise it has only limited relevance and is mainly used as handy political cudgel, as much by one side as the other I dare say. It must be clear that any country will be better governed if this is done by it’s own citizens, in it’s own interests, rather than by the citizens of another country, hundreds of miles away, who have little interest in benefitting distant citizens of another country with a different culture. Anyone denying that Scottish culture is very different from English has never spent much time in Scotland. Thank you. Impartial and honest. At least it gives a starting point to some debate, and a termination point for other views. I shall share this widely. Excellent piece! As a research scientist I am always encouraging students to look critically at the data. The most misleading aspect of many datasets is that they are presented in high quality, plausible formats that students are impressed by. If any piece of data has been generated by an eminent organisation containing proper remarks about estimates and errors, very quickly those remarks are sidelined and the data becomes gospel. Many scientific research programs have been distorted and deflected by marginal data. The world of economics as this piece rightly points out suffers from this very greatly. The economic arguments in favour and against Scottish independence are very flaky indeed. We can now see what happened after the last referendum when the price of oil collapsed. Looking at the extrapolation of absolutely solid and reliable data into the future is fraught with difficulties. If you start with flaky data then that extrapolation rapidly becomes laughable. Thanks Richard. I am a fellow professional who also has a degree in economics and finance. I have served on the board of three listed companies and been responsible for the Scottish (oil service industry) parts of those businesses. I have long dismissed the GERS figures for the same reasons you have now made clear. I have previously done this on the basis of hunch and my own experience over 30 years in industry. I have been privy to the very information which, as you point out, the statisticians don’t have, nor do they ask for. I have completed National Statistics questionnaires with the contempt they deserve. The notion that turnover and profit are correlated is, of course, nonsense. But that appears to be the assumption in GERS. In one of my earlier roles, I was ‘responsible’ for 10% of an international group’s revenues, but that represented over 30% of the group’s profits. I suspect that is the norm in the oil industry. The other glaring omission from GERS appears to be the ‘Head Office effect’. One of my employers had a head office on the outskirts of the M25 with more staff than the only UK operational office in Scotland. I’m certain that the majority of the GDP relating to this business – not to mention the payroll taxes from the HO, were attributed to the nearest tax office to Reading. Half of London is made up of head offices pushing pens but creating no GDP. It’s a farce! Keep up the good work. I will continue to enjoy watching you put that arrogant dog-food engineer back in his blinkered box. Some form of Scottish national accounts are required, that seems clear. In your view Is there better data available? What would you propose to do instead of using this current methodology? Today we learn that the UK Gov hasn’t even done an analysis of the economic effect of a hard Brexit, according to David Davis. In any company not carrying out a parallel type Of risk analysis would lead to the Organisation out door. Is HM Treasury still run by Oxbridge Clasicists? Exactly and you don’t need to be Einstein to work out why this is so!!! It is widely acknowledged, including by the unashamedly pro-union BBC, that the motivation for creating GERS was political. Clear evidence that the estimates were designed to support the aims of the Conservatives. No one has bothered to come up with anything different since then. Rather than dismissing GERS entirely (based on incorrect assertions), your time would be better spend speaking with the Scottish Government on GERS itself, if you have any interest in Scotland’s future. Maybe you don’t, in which case ignore everything I wrote. Anti-independence commentators like Kevin Hague get away with their claims because of overwhelming support by the almost entirely pro-Union media in Scotland. They are happy to promote him without challenge as it suits their agenda. Many of us on Social media have known for a long time that the GERS figures are unreliable but the mainstream media as a whole have tried very hard to maintain the pretence that they are accurate and produced by the Scottish Government, to be used as a stick to beat the SNP. Shame that Professor Murphy’s work will never reach a wider audience in Scotland, the media won’t print or broadcast anything that might undermine Kevin Hagues claims. Very confused can you answer my questions + tell me if I have the right idea of how Scotlands economy is worked out ? amounts they have collected from Scotland ? 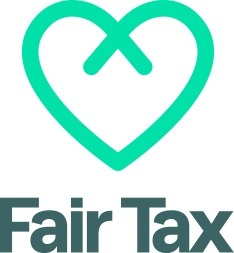 as I can not imagine the UK giving so much as a penny to Scotland unless it got a pound in exchange , which leads me onto the information of tax collected in Scotland , + sent to UK to be formulated , and then a percentage given back through the Barnet formula . Are these missing estimate figures of tax collected direct by the uk added to this formula before they decide what will come back to Scotland to run the country ? Excuse me? How do you ‘know’ they are unreliable? Because someone writes a blog and, without any evidence to support it, agrees with your stance? You understand what confirmation bias is, right? I’ll ask of you the same as I asked the author: Have you spoken to anyone in the Scottish Government who helped compile the data in GERS? I would assert the answer is no, given the ignorance in your reply. I strongly suggest you do. The salient point in all of this is that where Scotland’s economy is now is a consequence of UK economic policy. Tells us very little about the books of an indy Scotland. 1. GERS is compiled by the Scottish Government, from ONS data which by admission is non-political. No-one in the Scottish Government is disputing the data published. In fact, GERS was used as the backbone for the 2014 indyref campaign. With all this in mind, which statisticians of the Scottish Government have you spoken to in relation to your claims, what was their reply and where can I read it? Don’t write it in The National. Contact the Scottish Government via a FOI request and get the facts, if you’re so interested. 2. GERS has evolved since 2007. Statements of it being ‘pro-union’ are now quashed. The SNP sought advice from Margaret and Jim Cuthbert on reforming GERS to better reflect Scotland’s state of play. Your line “And it could be manipulated.” is true, however probably not in the way you meant it to be. Either the SNP are willingly shooting themselves in the foot by underselling Scotland… or the data is as accurate as what’s available (in some cases, even over-generous). You’ve made no reference to speaking to anyone in the Scottish Government on this, so I will deduce you have not. You are therefore making a massive assumption over what data is available, how it is calculated and how it’s compiled. With this in mind, your blog is merely an opinion and cannot be regarded as anything else. Pitted against ONS certified data, your blog is practically worthless until you can provide some substance to your claims. I look forward to seeing a blog where you’ve actually conversed with the Scottish Government on this matter. I expect an updated blog within 7 days. Hopefully you’ll return with some facts. Marty. Wind your neck in, mate. It may have escaped your notice, this is Richard’s blog; to write the opinions he chooses using available information and to open discussion of issues. It is not your right to “throw yer toys” demanding this and that. Instead, the way it works is : provide your evidence and conclusions to the contrary of Richard’s opinions/findings and refute his hypothesis accordingly. It’s not up to Richard to do that for you for aforesaid reason. IF you do, you will find that Richard WILL factor new, robust evidence into his thinking and writing. For the readers of this blog, a well reasoned and evidenced rebuttal elicits further thoughtful discussion. Foot stamping not only belittles the stamper – it belittles their arguments as well. So the figures are meaningless. All that matters is that a business, household or country should manage it’s expenditure according to it’s income. Keeping in the black and not borrowing unless it can service that loan. Two households with the same income can have different lifestyles, depending on how they manage their expenditure. Likewise a household with a smaller income can have a better lifestyle if they manage that income better. Richard, just read this line in an article on the financialisation of GDP. That is relevant to this and the wider discussion on data and measurement in economics. Economic or accounting data will never be objective. It is by its very nature subjective. All economic and accounting measures are human constructs and therefore reflect the norms, lawss, prevailing ideology etc of those in charge of compiling them. Precisely and that means that data can be criticised and questioned for not only its accuracy but also the decisions and ideas that underpin the data. Anyone claiming that the GERS data or any other data in the social sciences is beyond criticism and question needs to quickly learn that the social sciences have no objective measuring stick or weighing scales. So how do we go about fixing this problem of Crap data Prof, more specifically, what does the Scottish government need / have to do, to be able to come up with reliable figures that can not be challenged or are open to misinterpretation. Anyone with any knowledge of GERS knows they are statistical estimates and the only way to arrive at reasonably accurate figures (I use “reasonably” because all accounts at this level are, to some extent, estimates) is to have a totally separate accounting system for Scotland. But we haven’t, and we won’t for the foreseeable future. So the constructive way forward is to look at how inaccurate GERS may reasonably be. Looking at non-North Sea revenue per head, in aggregate its identical to the rest of the UK, although at 7.9% of total UK revenue it appears to be slightly short of our 8.1% population share, which would give an additional £1.5 billion of revenue. Looking at the component parts of revenue, I’ve been able to find reasonable explanations as to why our share should be lower than a population share (admittedly, based on surveys and statistics). Turning to spending, of the £68 billion total, £40 billion is under the control of the Scottish government and that is actually accounted for rather than allocated on a statistical basis. Of the remaining £28bn, nearly £18bn is spent centrally by the DWP. Is it reasonable? It appears to be, as it is broadly in line with our population share and statistics (again!) show that the Scottish non-oil economy has very similar metrics to the wider UK economy. So that leaves around £10bn of spending by Westminster to cover a whole range of services provided and which are allocated purely statistically. None of them are way out of line with our population share. So, the work I’ve done indicates that the range of error in GERS is most probably +/- a couple of billion in terms of the deficit, and I’ve seen nothing from other contributors to suggest anything other than that. In terms of the debate on independence, quite frankly it doesn’t matter whether our deficit is the £15 billion (9.5% of GDP) stated in GERS or somewhere closer to £13 billion (or £17 billion on the downside). Its still an unsustainable deficit, we cannot rely on oil revenues to close the gap and so the SNP needs to come up with fully-costed plans to increase government revenue, or state how it plans to cut spending. Until they do, the economic argument for independence is lost regardless of whether GERS is reasonably accurate or not. 2/ Higher income earners are massively skewed towards the east and south east of England: the south east alone has almost twice as many tax payers as Scotland paying on average roughly 50% more tax than in Scotland. Neither of the above point towards the amounts attributed to Scotland being materially understated. So the main thrust of my argument is that I’ve been unable to find any evidence that amounts are materially wrong and therefore the margin of error in the GERS deficit would appear to be small – and as I said, it really doesn’t matter if the deficit is £15bn or £13bn, and if we can’t set out reasonable and costed policies to tackle a large deficit then the economic argument is sunk. I see GERS is being attacked as biased etc.. so from memory a short history…. The Conservative Gov in the 90s gave in to pressure from the SNP to have some regional economic figures for Scotland. After publication the SNP didn’t like them, considering them partial and incomplete. They commonly showed a negative gap between income in Scotland and expenditure and the SNP refused to accept the truth of this, indeed claiming that Scotland subsidised the UK. In 1999 with devolution, the new Scottish Executive decided to review the figures and to try to make them as realistic as possible. The SNP nominated two nationalist-inclined economists, Margaret and Jim Cuthbert, to be their reps on the board that reviewed GERS and set up a new version. The Cuthberts stayed on the GERS cttee which published the annual GERS numbers until 2006 when they quit, declaring that the negative gap between income and expenditure (which they and the SNP had doubted was real) was “well established”. The SNP came to power in Holyrood in 2007 and have continued to publish GERS essentially unchanged AFAIK. GERS was used as the basis for the economics claims of the SNP’s “independence” white paper in 2013. 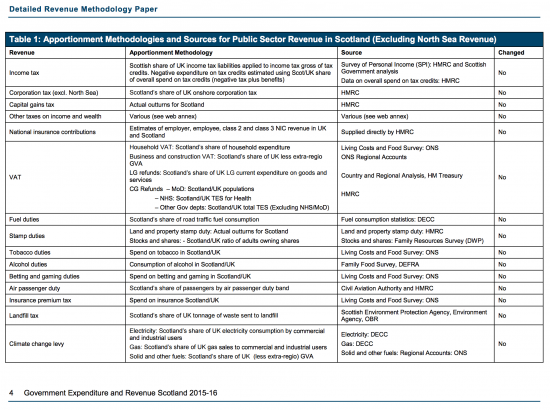 GERS isn’t perfect – what broad based economic data is? But it’s the best we’ve got, it’ the SNP’s own preferred tool and method and when it suits their book they’re happy to use it and quote it. But I gather the Cuthberts do not approve of it now? Not aware Cuthberts don’t approve, or why, but if they do their disapproval dates from after the SNP took responsibility for GERS. An example of how Scottish raised income tax and NI can be wrong. Over half of Scottish sector North Sea employees live outside of Scotland. There taxes and NI are attributed to there home address and not as Scottish taxes. Apart from anything else it’s the presupposition that the reaction to a deficit is to cut spending. Austerity on stilts as some have called it. Crap data. Crap economic predictions for indyref. Consider this Indy alternative. Every unit of currency of VAT (or equivalent) spent in a supermarket, petrol station, high street shop or restaurant will go through the Scottish exchequer (or equivalent), rather than Westminster. Every unit of currency earned will be taxed via Scottish tax authorities, and not HMRC (who moved their staff to London right after indyref1). Every unit of currency on duties for goods entering Scotland will go via Scottish coffers. Every unit of currency on NI contributions (if there is an equivalent; I’d prefer a slimmed down tax system) will go to Scottish coffers and not through Westminster. Every pint and measure will be taxed in Scotland, and much of it on goods produced in Scotland, so the economy will grow across all levels, rather than Scots producing, Westminster taxing (inefficiently) then returning a scrap from its table (even more inefficiently). There will be no needs for GERS (and its staff), the Barnet Formula (and its staff), Trident (and its costs), HS2 to never arrive (but pay for it now), BBC licenses, London media screaming at Scots for betraying London’s politicians, and so on. I can’t imagine anyone ever wanting our situation if they had the alternative listed above. It’s perhaps worth noting that the first year EVER where GERS showed the Scottish economy under-performing relative to rUK was the year for which the figures emerged in 2014. Does that mean the referendum itself was a problem? It seems unlikely when things like unemployment were relatively better and FDI was at an all-time high. Does it mean the figures were manipulated by wicked Westminster? Who knows? They’re all we’ve got for now. We can still use them to our advantage, as the Common Weal paper on “deficit parity” showed. We can and should argue for better data on ALL things, but for the time being it’s probably easier if campaigners stick to accepting that this is what we’ve got and we have to make the best use of it we can. The arguments are still in our favour if we’re sensible enough to know how to make them. I think that the GERS debate shows us just how centralised our country the UK is – centralised around Westminster. A centralised structure like this poses a real threat to any attempt to go it alone and as much as I can understand why pro-independence Scots might not like it, the Scottish people deserve to know more before they ‘press the button’. It also explains why our regions and local authorities are so weak and unable to stick up for local people. And there I was thinking ‘Gers was a reference to the tax case in the Supreme Court today and tomorrow. Gers states in it’s executive summary that it relates to Scotland “under current constitutional arrangements” i.e NOT Independence – so for people to continually to say it does are just strangers to the truth. The reason there is a deficit is because Scotland is charged a share of westminster beaurocracy and shared services. Given that we are talking about £28 billion this the number that makes the difference even though there are also questions whether all our income – particular offshore is included. We wouldn’t know for example, if it wasn’t for the RUSI that defence spending in Scotland is barely £1.4 billion but we ar charged over £3 billion in gers. Are the other reallocations out by this facxtor?